If you want to make the Grand Entrance for the Bar or Bat Mitzvah into the suite even more electric, then why not consider Indian Dhol Drummers all booked through me..
Our Magic Mirror Photobooth is always a winner with our clients. My name is Jonathan Waterman, I am an Award Winning, modern, lively and very unique, Toastmaster, Compere, Consultant, Master of Ceremonies and Coordinator for all Jewish Events. I am based on the outskirts of London, and my work takes me both Nationwide and Worldwide. I cover North London, Central London, City of London, South London, East London, West London, Essex, Hertfordshire, Buckinghamshire, Surrey, Berkshire, Kent, Manchester, Liverpool, Cardiff, Glasgow, Brighton, Bournemouth, Birmingham, Leeds and more. I will work very closely with you closely from day one, go through all nuts and bots in detail, fine tune the day, prepare the schedule with you, recommend lots of very modern and unique touches, work according to your personal style, coordination , take the stress of you all, and most importantly ensure that the boy or girl and families and friends, will have memories in their hearts for a lifetime and beyond. I have been covering various types of Jewish Simchas and Functions for many years, and these also include Weddings, Anniversaries and Corporate Events. 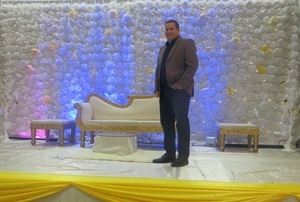 I am also a Booking Agent and the supplier of professional wedding and event services , some of these services include LED Inflatable Photobooths, Indian Dhol Drummers, Caterers, Decor, Lighting, Staging, Photographers, Videographers, Chocolate Fountains, Dance Floors, Jewish Bands, DJ'S, Harpists and lots more. Many towns are covered which include, Bushey, Stanmore, Hendon, Golders Green, Borehamwood, Shenley, Radlett, Edgware, Elstree, Mill Hill, Hampstead, Finchley, Harrow, Ilford, Chigwell, Loughton, Buckhurst Hill, Bromley, Orpington, Tunbridge Wells, Woodford, Southgate, Hove, Barnet, Swiss Cottage, St Johns Wood, Watford, Luton, Cheam, Sutton, Richmond, Kingston, Surbiton, Wimbledon, Westminster, and lots more. Many Venues are covered, some of these include, Holiday Inn Elstree, Blue Check, Allianz Park ( Saracens FC ), The Brewery, The Langham, Prince Regent Hotel, Woolston Manor, Shires Golf Club, Luton Hoo Conservatory ( Walled Gardens), Claridges, The Grove, Three Rivers Golf and Country Club, Stockbrook Manor, The Decorium, Millennium Mayfair, Rosewood London, The Village Hotel ( Borehamwood), Sopwell House, Hilton Watford, Abridge Golf Club, Stanmer House, The Savoy( London), Hilton Park Lane, Four Pillars Hotel and lots more..